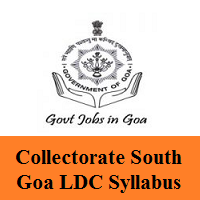 Collectorate South Goa LDC Syllabus: Aspirants those who have applied for the Lower Division Clerk, Multi Tasking Staff, Junior Stenographer, Talathi Posts through the South Goa Collectorate Recruitment must download the latest Collectorate South Goa Exam Syllabus 2019. And the officials of the दक्षिण गोवा कलेक्ट्रेट decided to conduct the Written Test in the month of March 2019. So, who have not yet started preparing for the test must and should refer to this page. Furthermore, you can easily get the detailed stuff about the southgoa.nic.in Selection Process 2019 and the Collectorate South Goa Exam Pattern 2019. To get hired by the South Goa Collectorate officials for the Lower Division Clerk, Multi Tasking Staff, Junior Stenographer, Talathi Vacancies, all the candidates must go through the below southgoa.nic.in Selection Process 2019. and candidates can directly check the rounds to prepare and perform well. Selection will be determined in accordance with the mark obtained by each candidate in the Written Test as per merit. We have gathered the suitable Collectorate South Goa Exam Pattern 2019 for all the vacant Lower Division Clerk, Multi Tasking Staff, Junior Stenographer, Talathi posts. So, candidates who applied for the separate posts can check the distinct patterns. Furthermore, you can check the below tables easily to get the दक्षिण गोवा कलेक्ट्रेट Test Patterns 2019 for Jr. Stenographer, MTS, Thalathis, Lower Division Clerks. You can get all the details like the name of the subjects, the total marks for the test. Start preparing for the Lower Division Clerk, Multi Tasking Staff, Junior Stenographer, Talathi Test should know the clear Collectorate South Goa LDC Syllabus 2019 initially. Moreover, you can easily crack the MTS, LDC Exam 2019, you must download and prepare with the topics through the Collectorate South Goa Exam Syllabus 2019 PDF. Below are the listed topics for each subject and the direct link to get the southgoa.nic.in Exam Syllabus 2019 in PDF for free of cost. Also, you can only get the exact date of the test from our Freshers Now webportal.